Another plant we’ve made sure to have growing in our herb garden is the Leaf of Life plant (Bryophyllum calycinum). It is also called the ‘Miracle plant’, ‘Air plant’ and ‘Life plant’. It is also called the ‘Live Forever plant’ since each of it leaves can produce new plants from the indention on the leaf’s edges. The Leaf of Life plant can be used to treat hypertension, bronchial troubles, coughs & colds, bruises, boils, ulcers, ear-aches, sprains & swellings, arthritis,and some worms. Some persons also use it to cleanse the bladder and to lower their blood sugar levels. 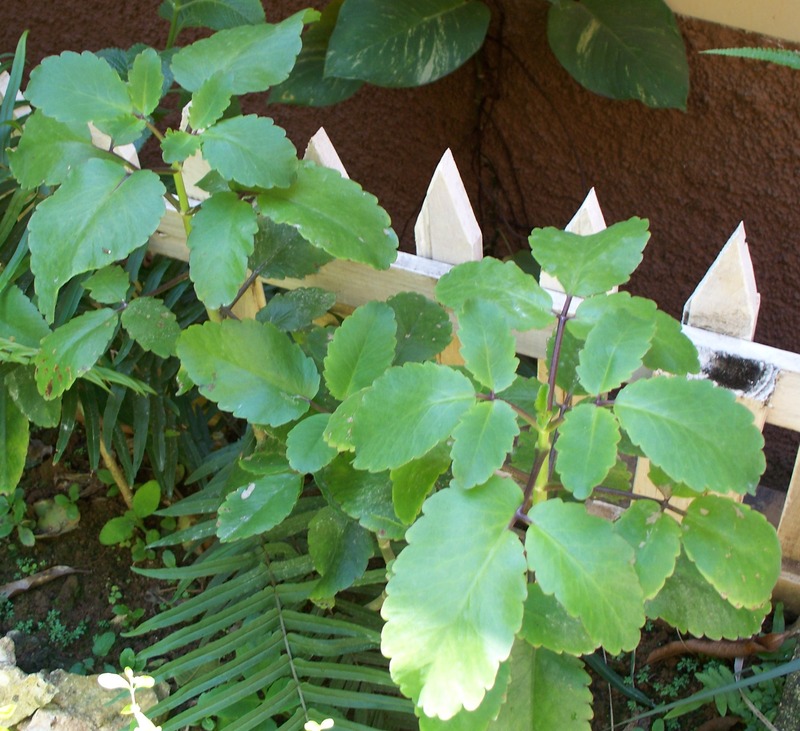 To use this plant, you may either eat the leaves raw or use them to make a tea. Note: This plant should not be used during pregnancy. 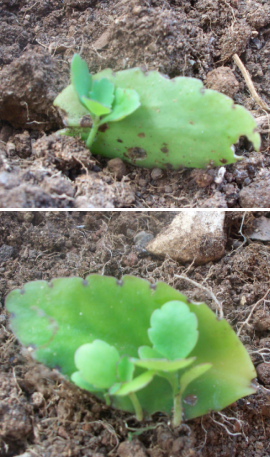 When treating insect bites, the leaves of the Leaf of Life Plant can be crushed and applied directly to the infected spot. The Leaf of Life plant (Bryophyllum calycinum) is very easy to grow. In our home in Jamaica it grows in all soil types … once there is moisture. I’ve even found some growing on rocks. To grow this plant, gardeners can place the leaf on top of moist soil and expect results in a few weeks. As a matter of fact, once a leaf of this plant falls unto moist soil it starts growing new plants. Leaf of Life plants are very fast growing, drought tolerant and can thrive in almost any weather conditions. For more interesting and useful information about the Leaf of Life plant visit this site @ raintree.com to read information from their database of tropical plants. I have two leafs from Jamaica. How do I start a plant? To begin growing, just place the leaf on top of moist soil and expect results in a few weeks. Thank you for such happy news. All the best to you. Sometime I add a leaf or two, depending on the size, to my green smoothies. Cleans the intestines and stimulates bowel movements. Thanks for the tip, I will surely give it a try. I think like some herbs, the Leaf of Life plant may stimulate uterine contractions during pregnancy. My wife and our friends were in Jamaica on Oct. 20 2016. Our tour driver stopped at an overlook, and while we were there, he gave us a Leaf of Life plant leaf. I stuck it in my camera case till Nov. 4, 2016; now in New Jersey it was planted. Happy to say it took root, showing a little sprout on Nov. 12 2016. YEA!!! Even in this cold kitchen on the window still it’s alive. Can not wait till summer. Hey that’s great Glen, the Leaf of life is indeed a very hardy plant. I’m glad it has sprouted, it should be growing beautifully by summer. Thanks for sharing.